What’s wrong with us? What’s it going to take? We’ve had another mass shooting. 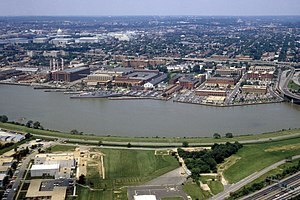 This time it was on a military base, the Washington Navy Yard. A base I once visited for business purposes. The security was lax then as it must have been now. To be fair, the level of security was equal to that necessary to protect national security information, not people. I heard a doctor, who was treating some of the victims of this latest mass shooting, speak on television. She said that we have to get control of evil and eradicate it from our nation. I’m sure she meant well but I was perplexed as to how our society would go about implementing her desire. Did she mean we needed to seize control of the populace, declare martial law, or institute a totalitarian state? That’s what it would take to eradicate it from all our people. However, that would not, obviously, by the nature of the ‘solution,’ eradicate it from the nation. I would hope she didn’t mean that. Barring a mass solution to this problem, we would have to identify individuals. But who would determine who was potentially evil. I say potentially because we can’t wait until someone proves they are evil by their actions, can we? It would be too late. But the laws of our nation preclude this pre-crime recourse. And, it’s no recourse, really, except in the movies; and we know how that turned out. So, perhaps we should turn to the medical profession to identify those who might offend. What criteria would they use? Psychiatry’s handbook, the DSM-V, has objective descriptions of maladies that affect individuals. And those individuals may perpetrate offenses. But who would apply the criteria? Doctors all over the nation would have to perform screenings. We’d have to indemnify and pay these doctors. They would be unavailable to treat those with other illnesses and we’d have to accept the losses that would result. So, instead, maybe we could target minor offenses and incarcerate potential offenders at that point? Oh, wait, we’re doing that all ready. How’s that working out for us? Not real well, huh? Maybe zero tolerance for gun ownership? But then only the criminals and terrorists would have guns. Law breakers, by definition, aren’t thwarted by zero tolerance laws. But, enough of this foolishness. Maybe, we could show real compassion. We’d identify those who might act out (like we do all ready), but go one step further, and intervene. We’d stop hiding behind political correctness; put our reputations on the line; and save some of these folks and their potential victims from the crimes that might otherwise occur. We’d educate the nation to reduce the stigma of dependency and mental illness. We’d do this so both the ill and their victims would seek help. We’d strengthen families, which are our first line of defense for the nation, so they could nurture those who might otherwise follow their bent into crime. Only when the family had done all it could do, would we intervene. We’d target those who abuse alcohol, drugs, and little animals. We’d confront those who exhibit mental disorders and get them help. We’d provide them with counseling, medical treatment, and follow-up; not institutionalization. We’d hold the patients and caregivers to account for failures. And we’d recognize the toll caregiving takes on the caregivers themselves and provide support. It will be hard and take self–sacrifice. And, maybe, we could acknowledge that we all are bent and capable of snapping. That we ourselves are responsible for our actions and that these actions are not always good. And realize that we need to thoroughly change our life’s direction; an impossible task for us to do. And because of that, realize we need a Savior from the punishment we surely do deserve. This entry was posted in Ponderings and tagged Compassion, Eradicate evil, Intervene, Mass Shooting, Mental disorder, Minor offenses, National security, Pre-crime, Self sacrifice, Washington Navy Yard, Zero tolerance by Mandated Memoranda. Bookmark the permalink.